getting wet isn't that big of a deal. if it were, i'd be seriously concerned for the economic viability of the nation's swimming pools. in premises such as those, people actually go out of their way to spend money to get wet. and not just in the swimming pool itself, but subsequently in either the post-swim shower or sauna. yet those of us who would rather undertake pelotonic duties have a concern about getting wet that seems dramatically overwrought at times. 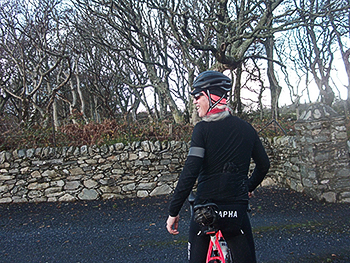 in my early years of being an expeditionist, riding as far as scotland on my bicycle laden with more panniers than were truthfully necessary, i met up with a fellow of similar intent on arran. 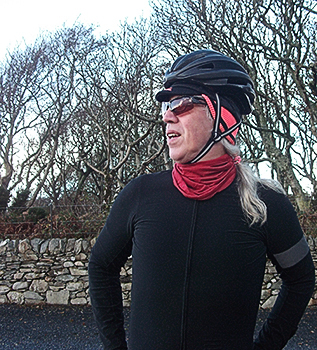 while i was clad in a pair of been bags (now sadly demised) and goretex overtrousers, matched to a waterproof breathable jacket, he wore a simple pair of black bibshorts and lightweight waterproof jacket. according to this chap, obviously more experienced in this particular art than was i, there was no benefit to be gained from riding in any weather conditions in anything other than standard lycra shorts. provided the upper torso was protected from the elements, there really was little need to worry about those pins. on the basis that my legs were bathed in perspiration at the time, despite the avowed breathability offered by goretex, i really had little by way of a counter argument. the world's cycle clothing manufacturers have spent years and years of research and development in a collective effort to keep us dessicated, with, it has to be said, varying degrees of success. as no word of a lie, whenever any purportedly waterproof garment arrives for review, when the rain finally turns up i go riding in the fervent hope that the associated marketing spiel is more factual than rhetorical. aside from the potential disappointment of getting wet, it is quite embarrassing to write paragraph after paragraph, eventually leading to the salient fact that the garment is less averse to precipitation than both the manufacturer and i would wish. generally speaking, i have found the more salubrious purveyors to make claims closer to the truth. since it is pertinent to the current discussion, rapha's recently reviewed winter classic jacket claims only to be water-resistant when in point of fact it kept me totally dry in the face of adversity. but when considering their shadow range of waterproof clothing, the ball-game is not quite the same. 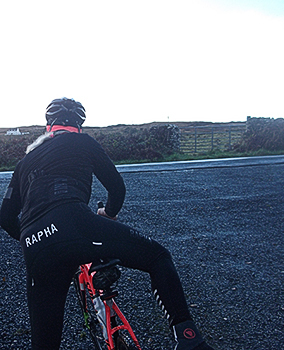 rapha's initial offering of shadow clothing got off to a slightly inauspicious start, launched as it was on 8 january this year. 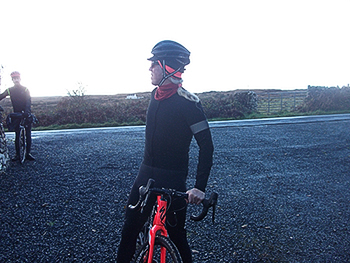 though that may seem the ideal time to offer waterproofs, considering the range then consisted of a short-sleeve jersey and bibshorts, it was either a brave or foolish individual who headed out on the sunday ride clad in such a minimalistic style in the depths of winter. the good part, however, was the knowledge that the new shadow fabric was pretty much every bit as waterproof as they said it was. to recap briefly, the threads which constitute the shadow garmentage are coated with a durable water repellent prior to being woven into lengths of fabric. this is then shrunk to minimise the tiny gaps between threads even further. more water repellency is then applied before it becomes a jacket, bibshorts, armwarmers or kneewarmers. from personal experience, that seems to work remarkably well. now that we're into the ravages of a cooler autumn/winter climate, rapha have now released a long-sleeve version of the jersey which, if i may be so bold, should probably have been first on the list. despite having vindicated the shadow fabric quite comprehensively at the start of the year, i cannot deny a certain tentativeness on first wearing the jersey on a particularly wet sunday morning. 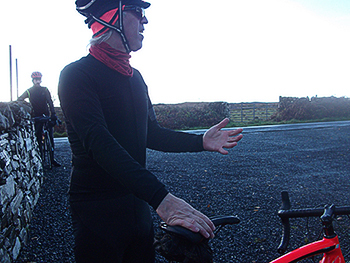 in this case, i wore only a long-sleeve merino baselayer below the shadow jersey, augmenting this with a distinctly non-waterproof gilet purely for visibility on a very grey morning. though i do understand the limitations of the material (it cannot be dye-sublimated) it's a shame that a jersey designed for the darker months is available only in black. and while i'm on that point, it has become something of a trademark for rapha jerseys and jackets to feature a hoop on the left sleeve. the shadow l/s jersey is no different, but in this case that hoop is built with scotchlite reflective material for enhanced visibility. however, since we in britain ride on the left-side of the road, this means that this reflective feature is effectively on the 'wrong' sleeve. a point worth considering, i think. however, after over two hours in pouring rain, during which time many of my fellow pelotonese would have been every bit as well having spent the time in bowmore's swimming pool, my torso was completely dry and warmer than i'd expected to be. it is far easier to keep warm when you're dry. 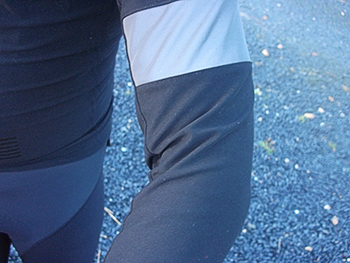 in fact, on reaching home and divesting myself of the shadow jersey, the merino baselayer was bone dry. and as if to underline the point, a mere five minutes later, i was able to fold the completely dry jersey and put it away in the drawer. my only fear is that the vision of the shadow fabric sloughing off all that rain is so addictive, that i'm likely to bang into a sheep or ride into a ditch while my interest is thus diverted. the three rear pockets, while reasonably capacious, are often a trifle awkward to get stuff in and out due to the elastic nature of the fabric, but it's that same factor that provides the incredibly close fit. if keeping dry is one of your many velocipedinal obsessions, rapha's long-sleeve shadow jersey ought to be top of the list. it's the first jersey i've ever worn that offers this level of protection from the elements; pair it with either a winter classic jacket or a pro-team softshell when the temperature demands and you need never go swimming again. rapha's long-sleeve shadow jersey is available in black only, in sizes ranging from xs to xxl and at a retail cost of £240.